No one contests that Tommy Skakel is the last person known to have seen Martha Moxley alive. Partly as a result of this ominous distinction, the second son of Rushton Skakel remains, to this day, a leading suspect, if not the leading suspect, in the investigation of her murder. Those who have labored to establish his innocence have faced as much difficulty as those who have struggled to prove his guilt. As such, Tommy has remained, for better or worse, in a culpable limbo for nearly twenty years. Such speculation has left quite a paper trail. Tommy has been interviewed and examined by doctors, detectives, police officers, and mental health experts, on repeated occasions, regarding the night of October 30, 1975. Sutton Associates has amassed a collection, as comprehensive as possible, of the materials generated by Tommy's suspected involvement in the incident. A few omissions were insurmountable: certain files, physical evidence, and recorded interviews, for example, remain in the possession of the Greenwich Police Department, and will likely never be made available. In addition to collecting and analyzing the findings of other professionals, Sutton Associates has conducted its own extensive investigation into the murder. 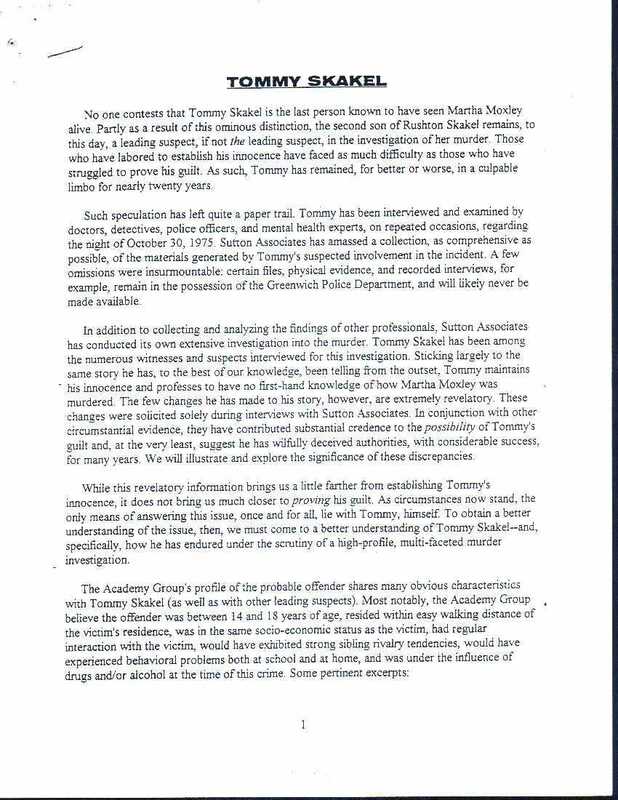 Tommy Skakel has been among the numerous witnesses and suspects interviewed for this investigation. Sticking largely to the same story he has, to the best of our knowledge, been telling from the outset, Tommy maintains his innocence and professes to have no first-hand knowledge of how Martha Moxley was murdered. The few changes he has made to his story, however, are extremely revelatory. These changes were solicited solely during interviews with Sutton Associates. In conjunction with other circumstantial evidence, they have contributed substantial credence to the possibility of Tommy's guilt and, at the very least, suggest he has willfully deceived authorities, with considerable success, for many years. We will illustrate and explore the significance of these discrepancies. While this revelatory information brings us a little farther from establishing Tommy's innocence, it does not bring us much closer to proving his guilt. As circumstances now stand, the only means of answering this issue, once and for all, lie with Tommy, himself. To obtain a better understanding of the issue, then, we must come to a better understanding of Tommy Skakel--and, specifically, how he has endured under the scrutiny of a high-profile, multi-faceted murder investigation.